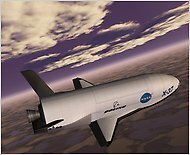 Not going to touch TPL’s comments, but the X-37B is probably going to be a maneuverable spy ship, but in space. You won’t have to worry about someone shooting it down. but in space. You won’t have to worry about someone shooting it down. Of course you do…The Chinese have already demonstrated the ability to take out a satellite…..